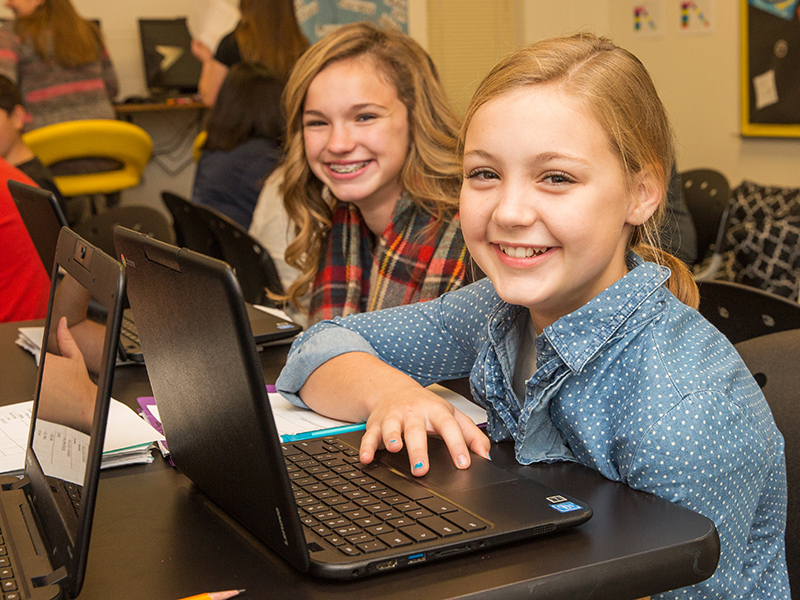 Cisco ISD’s blended learning redesign process is based on improving instructional opportunities for its students. As the district began to think of ways to do this, Cisco Superintendent Kelly West reflected that, “any technology that brings the big wide world into rural Texas is a benefit.” Understanding the increasing importance of technology in the lives of students, Superintendent West encouraged teachers to explore ways to promote 21st-century learning environments. Initial attempts could best be described as technology "add-ons," rather than efforts to reform teaching and learning. For example, students might make an occasional visit to a central computer lab for research or complete a year-end project. However, no clear vision existed for which technology-enabled instructional approaches would be the most beneficial for students. When the opportunity to apply for the Raising Blended Learners grant emerged in 2015, the district leader and his colleagues saw a pathway for creating and operationalizing a more comprehensive vision. In fall 2016, Cisco started implementing their blended learning pilots as one of five Raising Blended Learners demonstration sites. Prior to launch, Cisco spent a year laying the groundwork for implementation and testing new approaches to instruction. Beginning in fall 2015, a team comprised of district and campus leaders, and pilot teachers, formed to develop a vision and plan for transforming from highly-traditional teaching and learning to student-centered blended learning. Cisco’s initial redesign process was supported by a series of design workshops and planning sessions. These sessions helped Cisco leaders envision and write a plan for systems-level change, develop a viable pilot for initiating their journey, and prepare for launch. September 2015: Initial Design Workshop. The Cisco team, along with 73 other Texas teams, attended a two-day, expense-paid blended learning workshop as part of grant competition funded through Raise Your Hand Texas. During the workshop, Cisco received expert coaching on how to develop a blended learning business plan. February 2016: Finalist Workshop. Cisco and nine other finalist teams attended a workshop where they received professional assistance to refine their blended learning business plans. April 2016: Grant Awarded. Cisco ISD was selected as a Raising Blended Learners initiative winner of up to $500,000 and three years of intensive technical assistance to implement a blended learning program. May-August 2016: Pilot Planning and Preparation. The “Year 1” Cisco blended pilot team participated in numerous professional development and planning activities in partnership with their Raising Blended Learners’ implementation partner, CA Group, to prepare for implementing blended learning in their classrooms. Cisco’s redesign process extends beyond the initial launch of blended learning pilot classrooms. Throughout the first 18 months of blended implementation, Cisco has participated in opportunities for technical assistance from an ecosystem of experts, offered through Raising Blended Learners. In addition to site-based implementation support, Cisco pilot teachers and leaders have attended site visits to other blended learning campuses and engaged in ongoing learning opportunities available to Raising Blended Learners’ districts, including a convening in December 2017 focused on building leadership competencies to support sustainable scale. Cisco continues to participate in all opportunities for continued technical assistance, especially those aimed at supporting the leadership to develop deeper capacity across district and campus leaders. They believe this capacity is critical to sustaining the district’s early innovation work. During the remaining 18 months of the grant period, Cisco will formalize teacher onboarding, ongoing professional development, and a coaching cycle for blended teachers. They also plan to create continued opportunities for building new cultural norms through a community of practice strategy.